Robotic Innovations (Pty) Ltd – a turnkey robotics and industrial automation specialist based in Route 21 Corporate Park, Irene – describes itself as a provider of robotic solutions to non-OEM industries. MechTech visits the company and talks to Altus Mostert, its managing director. Altus Mostert, managing director of Robotic Innovations, shows us a robot submerged arc welding system currently under development at his Irene premises. 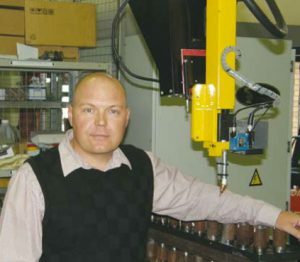 Robotic Innovations was founded by Mostert himself in 2004 – after having developed extensive experience of robotics and turnkey automation solutions while running the local branch of an overseas automation company. Mostert now describes the company as a specialist in robotic applications, “with an amazing team – the reason for our success. He gives us some examples: “The automotive tier suppliers use much more MIG/MAG welding than the OEMs, where spot welding predominates – so robotic MIG/MAG welding applications have become a speciality of ours.” he explains. “We also do a lot of strange handling applications – putting up and putting down different product items – and first-of-a-kind applications – in the mining industry for example. We have taken on some pretty hectic projects. In hindsight you would think we were crazy but, at the end of the day, they work,” he adds. The company prides itself on its ability to provide automated robotic solutions that solve each customer’s unique challenges and needs. “Our services usually start with a concept design for the application a client brings to us – a broad conceptualization of how robotics can get the client’s job done,” Mostert says. “Once the client has approved the concept design and we have been awarded the project, we would do a finer detailed design of all of the mechanics. We then use these designs to do simulations using the Robo- Guide simulation package developed for use with Fanuc robots. Once everything works in RoboGuide, we would then sub-contract the full mechanical design detail to a preferred supplier. When these detailed designs come back to us, we re-simulate functionality and only once we are sure everything works, do we tell our supplier to go ahead and build the physical system,” he says. 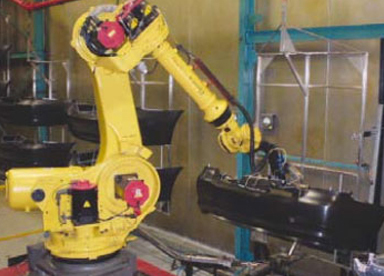 A first-of-a-kind robotic system to transfer bumper parts from the washing bay system onto the paint system. Venture in Wadeville, South Africa is the only manufacturer in the world that does not depend on humans for this application. Robotic Innovations’ services usually start with a concept design for the client’s application. Robots are now much more flexible and can be justified based on far smaller production batches. 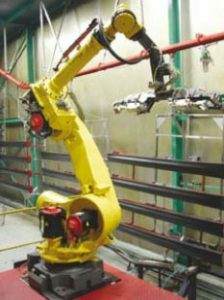 Expertise includes factory automation systems for robotic welding, robotic palletising, robotic assembly, robotic materials handling, robotic material removal and robotic machine tending. “Most of our robotic solutions consist of one or two robots working in a cell but we have done systems with as many as five robots,” adds Mostert. “Our largest targeted industry is probably the trucking industry and we have done work for all of the major players” he says. 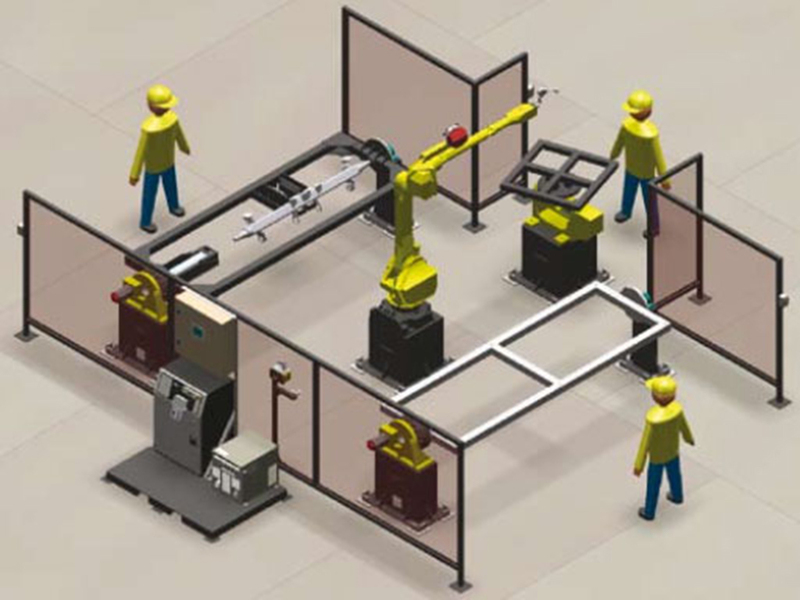 Robotic Innovations exclusively supports four or five key brands, Fanuc for the robots, Lincoln Electric on the welding machine side, Binzel for welding torches and, on the PLC and control systems side, mostly Siemens or Allen Bradley. “We made the strategic decision not to apply for agencies,” explains Mostert. “In some ways agencies are a very nice money spinner but they are very difficult to support without backup. Instead, we have chosen companies that are, first of all, reputable and secondly, have local offices with proper technical support. If you are offering a service and you pick up a technical problem, you need to know that your suppliers are going to support you well. 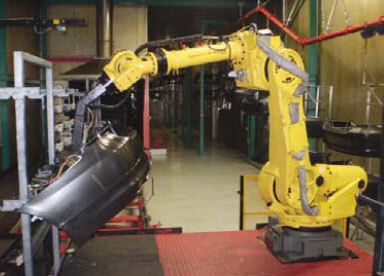 The pick-and-place robot system with its unique gripper – shown transferring injection moulded side-skirts for BMWs. Also, Mostert tells us, you no longer have humans between two automated systems. You don’t have to make special provision for staff lunch breaks or shift changeovers. “This has totally removed a bottleneck in the production line. “Everyone is still under the impression that robots cost millions and that jigging is cheap. In fact, it’s the other way around,” he tells us. “Robots are cheap and it is the jigging that pushes up the price of a system. But it’s getting better all the time – robot systems are now much more flexible and much cheaper. Shops that have never considered automation before are now turning to robots in record numbers,” he concludes.